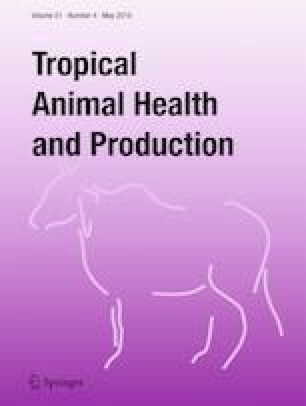 This study aimed to investigate the genetic variability of conception rate (CR) and non-return rate (NR) in Iranian dairy cows under heat stress conditions. A total of 34,304 records of CR, and NR at 45 days (NR45) and 90 days (NR90) after the first insemination, from 21,405 Holstein cows were included in this study. The weather records were obtained from seven meteorological stations located at a distance of less than 70 km from the farms. Temperature-Humidity Index (THI) was determined for each record on the insemination day. The statistical models for CR, NR45, and NR90 included the fixed effects of herd-year-season, parity, milk yield, and THI. Genetic components were estimated using an animal model and fitting random regression models on THI based on the Bayesian method. Results showed similar decreasing trends for CR, NR45, and NR90 when increasing the THI levels. The additive genetic variance of heat tolerance for CR, NR45, and NR90 were 0.008 ± 0.0004, 0.0262 ± 0.007, and 0.0254 ± 0.006, respectively. The additive genetic variance of heat tolerance increased directly with THI, and therefore, our findings indicate that a combined selection using heat tolerance can be considered for genetic evaluation of reproduction traits under heat stress conditions. The authors would like to thank the Industrial Agriculture Company of Vahdat, the general directorate of the meteorology, and veterinary organizations for providing the reproductive and meteorological data. Animal welfare and use committee approval was not needed for this study as datasets were obtained from pre-existing databases.